They look for ‘dissidents’ early in Russian-occupied Crimea. On May 27, the day before an exam, FSB officers turned up at a school in Feodosia to grill Crimean Tatar 9th grade students on possible ‘incorrect’ thinking. School No. 15 in the village of Blyzhnye near Feodosia is a Russian-language school, but there are some classes with lessons in Crimean Tatar. The FSB turned up on Friday morning, and each Crimean Tatar 9th grade student (14-15 years old) was questioned separately, in the presence of his parents and the school psychologist. Perhaps most chillingly, these interrogations were probably due to ‘information received’ from the school head. According to Suleyman Kadyrov, a member of the Feodosia regional mejlis [Crimean Tatar self-governing body], during the days around May 9 or Victory Day, the school head had appeared in the classroom and noted that the children were not wearing the St George ribbon. This ribbon is widely assumed to be linked with World War II, yet began being worn only after a campaign by a pro-Kremlin organization and the state-owned RIA Novosti in 2005. Since Russia’s invasion of Crimea and military engagement in Donbas, it is often seen, with cause, as an indication of a person’s support for Russia’s treatment of Ukraine and the Kremlin-backed militants. The school head extracted 10 roubles from each of the students with which she bought the ribbons and personally pinned them on the kids. When they had put on the St. George ribbon, when they’d taken it off and under what circumstances. Had they removed it by themselves, or because somebody asked them to? The parents are outraged, the children terrorized, and the FSB is promising that this is not the end of such ‘conversations’. It is possible that the school has, in any case, been under surveillance. On Oct 5, 2015, the teachers working in Crimean Tatar classes at this same school were greeted on Teacher’s Day by students, parents, members of civic groups and the local mejlis. 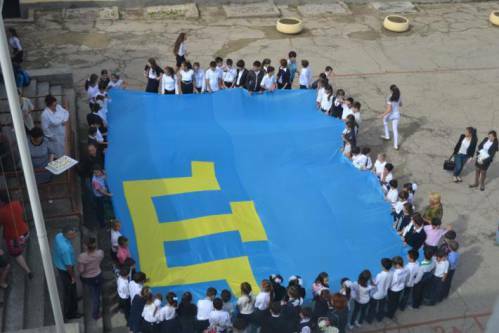 During the festivities the students unfurled a huge Crimean Tatar flag. The interrogations on May 27 were not the first time that children have been terrorized since Russia’s annexation of Crimea. Armed searches began early, with armed and masked men turning up at a madrasa or Muslim school in the village of Kolchugino outside Simferopol on June 24, 2014. The 13 children staying there were fast asleep when the men burst in without providing any identification or court order and began searching everything, breaking down doors and smashing windows in the process. Given the latest FSB intimidation of school children and grilling about words like ‘annexation’, it should be noted that such brutally truthful words resulted in a formal warning of ‘the inadmissibility of extremism’ back in June 2014. For the moment not against children, but Friday’s interrogations are a frightening step in that direction.